Sparky’s Plumbing is ready to solve all of the plumbing and drainage issues you may have whether residential, mobile homes or commercial, Sparky’s will be available 24/hrs a day! From leaky faucets to broken pipes, a new water heater, a new waterline, or new construction, Sparky’s will take care of it all! Call Sparky’s for same-day leak detection and leak repairs! Sparky’s Plumbing will take care of the most intimidating clogs and will inspect, repair or replace your garbage disposal units if needed. With our 24hr Emergency Service, rest assured that you can count on Sparky! 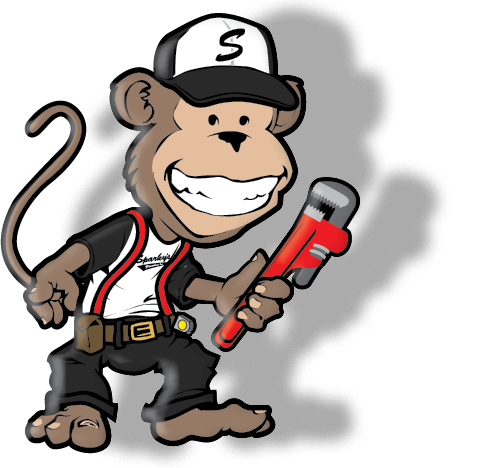 Sparky’s plumbers will arrive to your home with fully equipped service vehicles to restore your homes plumbing emergency. If you have a blocked drain, a collapsed or clogged sewer line, give Sparky’s a call! Our plumbers have the expertise and state of the art technology to handle your drain and sewer needs. Sparky’s Plumbing offers full service water heater repairs, inspections, or new installation. From traditional water heaters to solar or tankless water heaters, Sparky’s Plumbing will recommend that best solution for your individual needs and budget. Sparky’s Plumbing will provide professional installation for your showers, sinks, bathtubs, toilets for all your plumbing needs. Sparky’s will also assist you with selecting the correct brand and model within your budget while offering you the best warranties and service to suit your needs. Sparky’s Plumbing provides quality re-piping solutions for apartments, homes, mobile homes, and commercial buildings using state of the art, maintenance free valve and piping systems (i.e., copper, PEX) with excellent warranties and with expertise.